PARNEVU T-Tree Relaxer - Regular strength (also available in Super strength) straightens better while eliminating dry flaking and relieves itching while leaving scalp and hair moist. 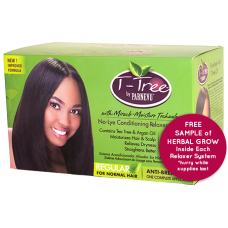 Experience the benefits of combining T-Tree conditioning research with the latest in relaxer system technology. The PARNEVU system straightens hair and keeps it straight longer by conditioning throughout the entire relaxing process. Greater penetration of conditioning agents during each step of the application helps restore and rebuild your hair leaving it straighter, softer, shinier, and full of body. PARNEVU T-Tree Protective Gel: Provides protection to the sensitive areas of the scalp. PARNEVU T-Tree No-Lye Conditioning Relaxer Crème Base: A rich creamy base that straightens hair quickly with lasting results. Added conditioners minimize over-processing, leaving hair in the best possible condition. PARNEVU T-Tree Liquid Activator: Mixed with Relaxer Crème Base to create a creamy emulsion that straightens hair. Activator bottle is sealed with child resistant cap which prevents leakage and reduced risk of ingestion. PARNEVU T-Tree Neutralizing & Conditioning Shampoo Color Indicator: An advanced formulation that cleanses deeply, neutralizing and removing dulling buildup from your hair. Shampoo turns from pink to white signaling the hair has been rinsed thoroughly. PARNEVU T-Tree Moisture Plus Conditioner: A rich blend of strengthening T-Tree conditioners and moisturizing agents that helps retain moisture, prevent split ends, improve manageability and protect hair from heat damage. PARNEVU T-Tree Scalp Oil: Uniquely formulated to stimulate, heal, and repair hair and scalp, reducing itching, flaking, and dryness while promoting healthy growth.